Living forest, living culture consists of a stop-motion animation made outside at the Oawa mountain and this installation inside the old sake brewery. In this work I have been inspired by natural materials in the area, the Shinto tradition and the different stories that surround the Oawa mountain. 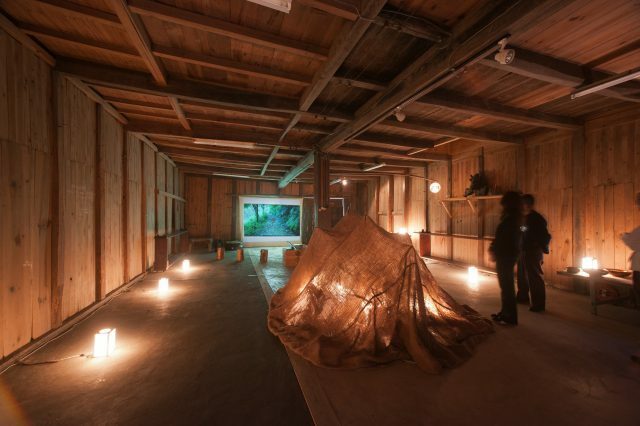 The installation inside the old sake factory consists of several parts that are all bind together by the film. The animation and the installation works as a connection between the mountain and the village, between traditional and modern lifestyles and between nature and culture. A large part of my work is to make research about the place I am in. In the final work I include materials and objects that connect to stories and traditions that I have been told about the area. 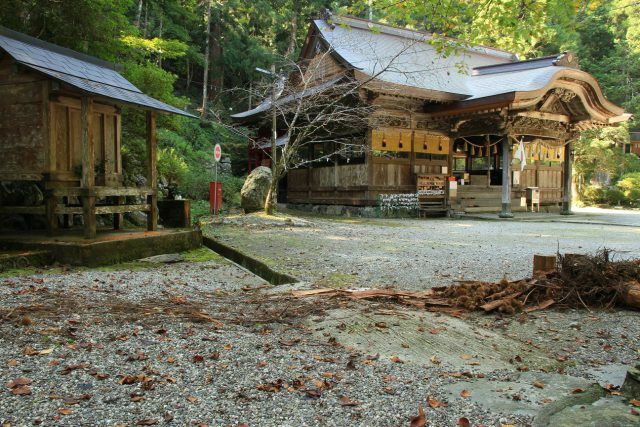 In Kamiyama I was interested in the many connections between different natural materials, traditional techniques and Shinto. When researching about the old saké brewery I became interested in the connection between saké brewing and Shinto. 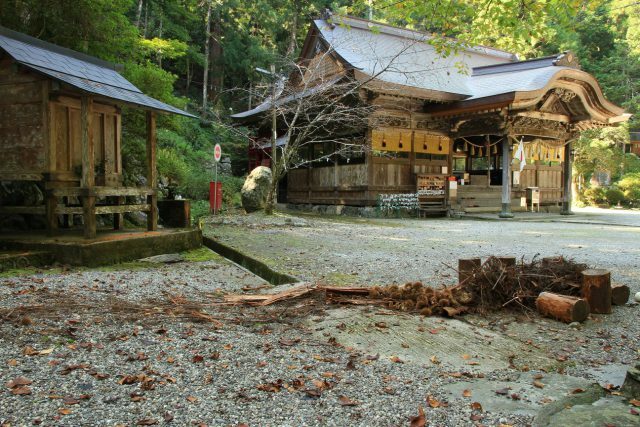 A starting point for my work was the story of how a saké bottle was rolled down from the top of the Oawa mountain and where it stopped rolling should be the place to build the current Shinto shrine. 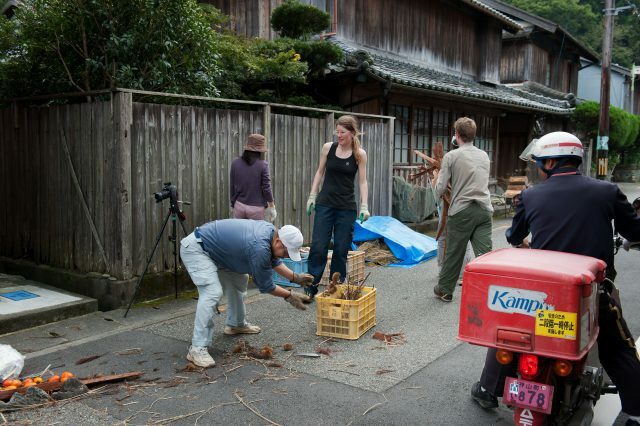 In my film a small ceramic sake bottle, made by the local ceramicist Mr.Katsuaki Takashima, rolls all the way to the old saké factory and makes a connection between the top of the mountain, the Shinto tradition and sake brewing. I was also told about the use of kaki dyed hemp in traditional sake brewing and how Tokushima used to grow a lot of hemp before it was forbidden by the US after Word War second. In the film and in the installation I chose to work with kaki dyed hemp to bring forward the use of hemp once more. 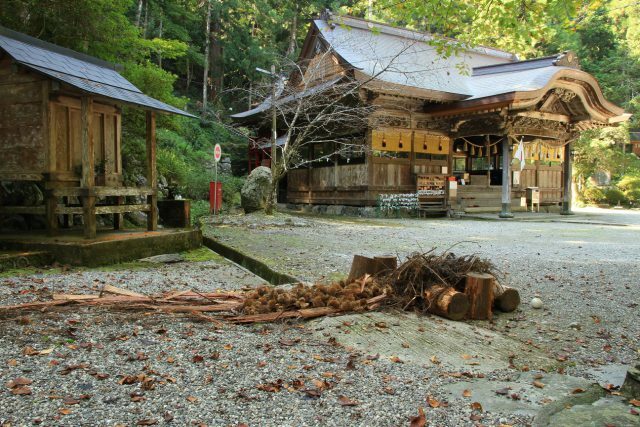 I was told about the deity of the Oawa shrine, Oho-ge-tsu-him the deity of great food, and how she produced five types of food from her body. In the film and in the installation I have worked with the silkworms, rice, millet, large beans and small beans which was the food that she produced. In this way the place has affected what materials I have chosen to work with and then I have transformed the materials and stories to play a part in the art work. The stop-motion animation is a way for me to work out in nature on a large area without leaving any physical traces and without using materials harmful to the environment. The film can be seen as a close look to a place and its materials. The stop motion animation slow down time and make you notice subtle changes in nature that you may not see with the clear eye. The making of the film is a process totally dependent upon the specific conditions of the place: the weather, the natural material available and the people and animals living there. It is a way of letting go of control and try to work with nature instead of struggling against nature. Making the film is equivalent to making a landscape drawing out in nature, except the result does not visualize until in the editing part. It is like drawing directly with nature, with those fleeting moments that soon disappears. Working with the materials, shaping and forming them for each shot, is also like making a sculpture over and over again. The film sharpens the reading of nature and the nearby landscape and show in a playful way nature being alive. In the film natural materials from the forest and from the agricultural landscape, travel from the top of the Oawa mountain in to the old sake brewery. There are so many uses that we can make of the natural materials in our surroundings and in the film I want to bring forward what is available in the nearby area. I am very worried about the climate change and all other ecological problems that are caused by the lifestyle of modern society. We all try to do our best, but still the temperature is rising on earth. This is a very complicated problem and it is not solved by individuals or even communities, but we all can do small things to contribute. 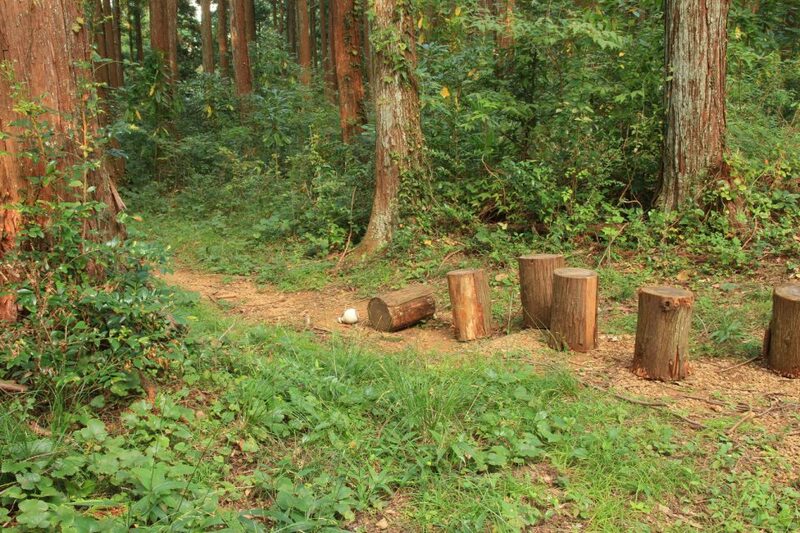 I believe that Japan has very good conditions for making the society more sustainable. 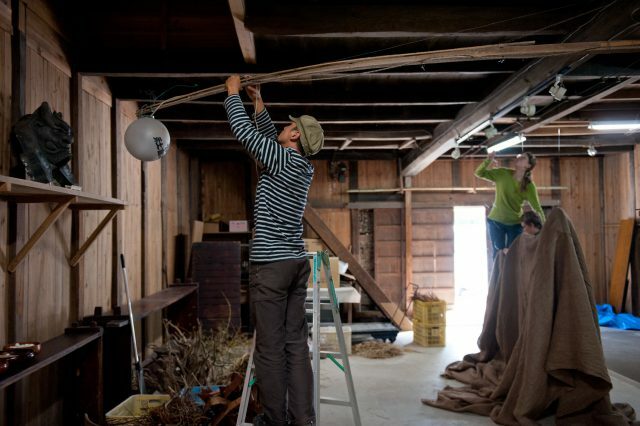 In Japan there is an abundant culture and knowledge of using natural and local materials and a lot of traditional techniques are still very much alive. 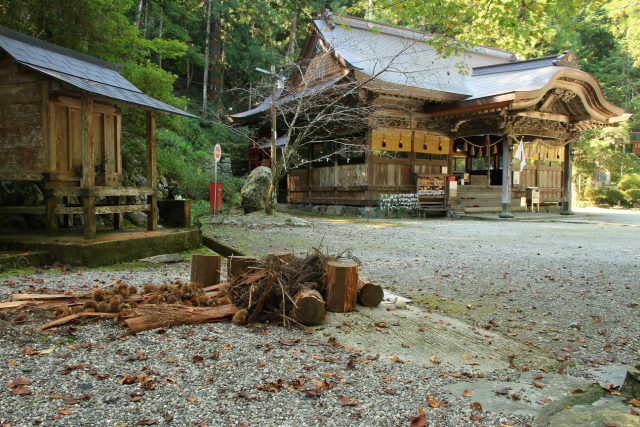 The awe for nature that exists in the Shinto tradition also seems to be a base for the culture. At the same time, Japan like most industrialized countries is a car centred, fossil fuel dependent society and what strikes you as a visitor maybe most is the abundant use of plastic and packaging. Even if we recycle it is still a material waste and an energy consuming process. I believe that we need to change our societies all over the world in a much more profound way to stop the development of climate change. I think that the answer is to be found in the local skills, the handmade and the natural materials. All that knowledge exists already here in Japan and in Kamiyama, and I think it should come forward much more in to everyday life. In the installation inside the old sake brewery I wanted to bring about a contrast between materials of modern society and natural materials and artefacts of the Shinto traditions. Inspired by the shape of the mountains surrounding Kamiyama I have placed these materials inside sculpture of a kaki dyed hemp cloth where one can only partly see the objects inside. To me this is an impression of being in Japan, where so many things are covered and layered and you can only get a glimpse of what is actually inside and sometimes you just see the surface. 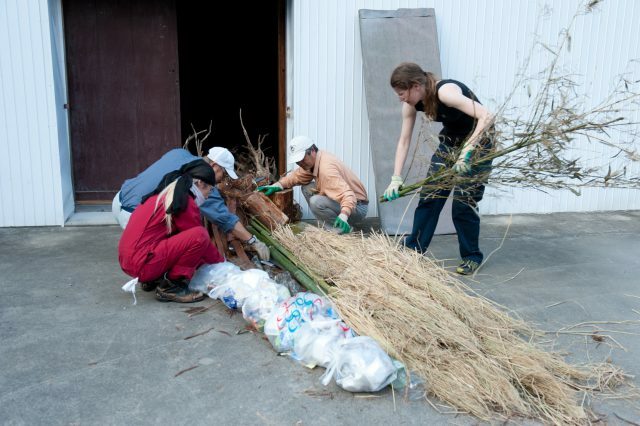 A part of the installation is the making of textile shopping bags naturally dyed with plants growing in the area, such as indigo and kaki fruits. During the exhibition week I will dye more bags with other plants with the help from Mr.Ryoji Maeno. A naturally dyed shopping bag is a very small thing, but it could work as an everyday reminder of us not using plastic and be a portable link to old traditions and nature. I want to thank all the staff at KAIR, my supporters, the volunteers, the children that act in the film about the grains of Oho-ge-tsu- (Genta Nakayama, Shiho Uemoto) and all others that have helped me to realize this exhibition. Without you this work would not have been possible and I express my greatest gratitude to your patience, time and efforts to help.